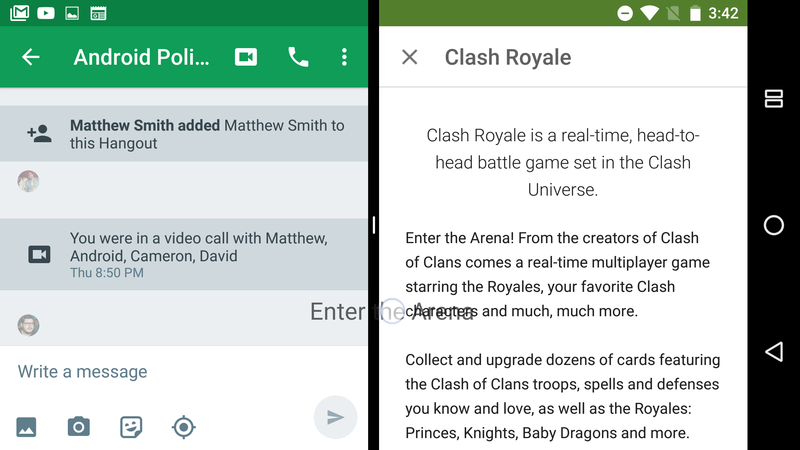 You're probably aware of Google's new multi-window feature in Android N. We've demoed it a few times, but there's yet more multitasking goodness to go over. When you're in split-screen, it's possible to drag and drop text between windows. Yes, Samsung has done this for a few years, and the Android N implementation is messy. Buy hey, we're getting there. This appears to only work with text right now, whereas the Samsung version can do images as well. You need to highlight the text first on Android N, then long-press and drag to the other window. This feature does feel very buggy and incomplete at the moment, but this is a developer preview. Some apps don't work at all, and the keyboard on phones blocks enough of the window that copying from editable fields is almost impossible. It's not ideal, but it does work. Hopefully we can expect to see a cleaner implementation of this feature in the final release. Google's multi-window support does include the ability to drag and drop images and other content as well, but it requires implementation of new APIs. There don't appear to be any apps right now that we can use to test this. It's happening, though.